A giant of the Indianapolis skyline, standing at a majestic 376 feet with a shimmering glass exterior curtain wall as blue as the home jerseys of the city's NFL football team, the new JW Marriott® Indianapolis hotel certainly catches the eye. Scheduled for completion in February 2011, the 34-story building will be the largest JW Marriott hotel in the world, as well as the tallest hotel in Indiana, with more than 1,000 guest rooms and 50 meeting rooms. With a project team led by global architectural firm HOK, Indianapolis-based CSO Architects and Hunt Construction Group, also of Indianapolis, the JW Marriott Indianapolis is being built sustainably, incorporating several energy-efficient and green building materials. A significant part of this strategy is the insulating of all ductwork throughout the hotel to increase thermal efficiency and acoustic control within the HVAC system. The hotel's owner, Convention Center Headquarters Hotel, retained Circle Design Group, Inc., of Indianapolis to design the hotel's HVAC system. 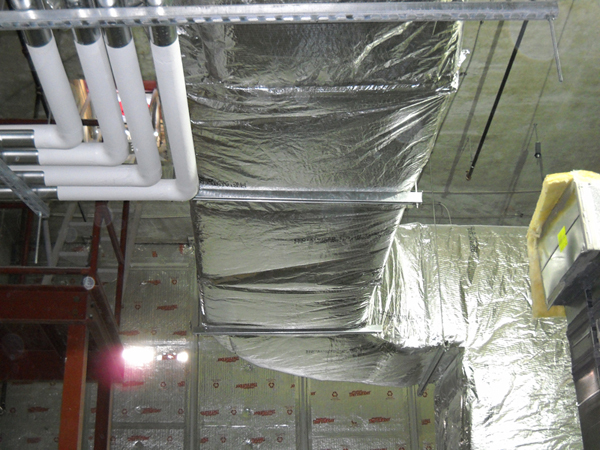 Understanding the importance of duct insulation on the project, the HVAC engineering firm issued an open specification for flexible blanket insulation and a small quantity of rigid board to be installed on the exterior of all round and rectangular sheet metal ducts throughout the building. "Whenever we have concealed ductwork on a project, we're going to insulate it because we need to avoid the possibility of condensation on duct surfaces, and we do not want the ductwork to transfer energy to unconditioned spaces," says Kerry Smith, principal at Circle Design Group. 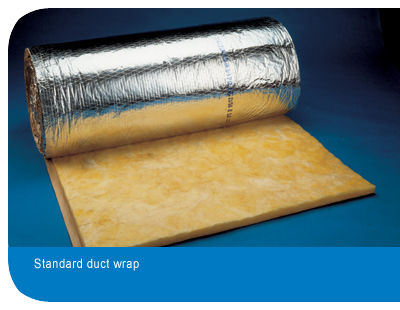 "In these applications, flexible blanket insulation, or duct wrap, is usually our first choice for duct insulation because it can be used for both duct shapes." 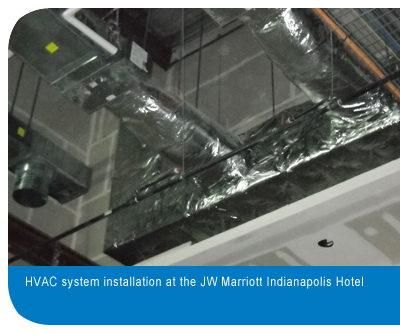 Hunt Construction Group hired Bright Sheet Metal of Indianapolis to fabricate and install rectangular and round metal HVAC ducts on all 34 floors of the hotel and Alloyd Insulation Co., based in Dayton, Ohio, to insulate the ducts. Duct sizes ranged from 24 to 576 square inches in the rectangular shape, and 6 to 24 inches in the round shape. Working with a crew that ranged from 4 to 15 workers, Alloyd Insulation followed close behind Bright Sheet Metal's crew, applying duct wrap insulation to the new ducts. Alloyd Insulation chose to use CertainTeed® SoftTouch™ Duct Wrap for the project, a foil scrim kraft (FSK)-faced flexible fiberglass blanket insulation used to insulate the exterior of rectangular and round HVAC ductwork. When properly installed in the correct thickness, SoftTouch reduces unwanted heat loss or gain from equipment and ductwork and virtually eliminates ductwork condensation problems that can often lead to mold and microbial growth. The job called for 1,400 rolls of duct wrap, supplied by Indianapolis distributor General Insulation Company. The biggest challenge encountered by Alloyd Insulation was working at heights of 20 to 30 feet to meet the high ceilings of the hotel's two ballrooms. "We had to use hydraulic lifts to get up to the ductwork in the ballrooms, and there was a limited amount of work you can do at one time because we had to keep moving the lift," says Kyle Ewing, project manager for Alloyd Insulation. "But, our crew worked hard and got the job done." Throughout the project, the Alloyd Insulation crew was impressed with the SoftTouch Duct Wrap. "Our crew liked the CertainTeed duct wrap because it held up and was easy to pin throughout the project," Ewing says. "They liked it so well after working with it a while, they obtained approval from Circle Design Group to remove rigid insulation board from their specification and change it to an all-duct wrap project." Alloyd Insulation will finish their insulation work, right on schedule, in late August. Circle Design Group is happy with how smoothly the installation of their HVAC system design has gone. Due in part to the use of Building Information Modeling (BIM) for coordination throughout the entire project, everything has run smoothly for the members of the project team. "Alloyd Insulation worked closely with our field engineers and had a high level of coordination with our other contractors," Smith says. "Everything ran on schedule, with very few issues. It's been a great project for all of us." JW Marriott Indianapolis is the showpiece of the new Marriott Place, an expansive hotel complex, which features three other smaller Marriott-branded hotels a Courtyard Marriott, a Fairfield Inn and a Springhill Suites.